There were 669,972 Mongols in Liaoning in 2011, making up 11.52% of Mongols in China. The closest Mongol area to the sea is the Dabao Mongol Ethnic Township (大堡蒙古族乡) in Fengcheng, Liaoning. With 8,460 Mongols (37.4% of the township population) it is located 40 km (25 mi)from the North Korean border and 65 km (40 mi)from Korea Bay of the Yellow Sea. Another contender for closest Mongol area to the sea would be Erdaowanzi Mongol Ethnic Township (二道湾子蒙古族乡) in Jianchang County, Liaoning. With 5,011 Mongols (20.7% of the township population) it is located around 65 km (40 mi)from the Bohai Sea. The Buryats (Buryat: Буряад, translit. Buryaad; Mongolian: Буриад, ᠪᠣᠷᠢᠶᠠᠳ, Buriad), numbering approximately 500,000, are the largest indigenous group in Siberia, mainly concentrated in their homeland, the Buryat Republic, a federal subject of Russia. They are the major northern subgroup of the Mongols.Buryats share many customs with other Mongols, including nomadic herding, and erecting gers for shelter. Today, the majority of Buryats live in and around Ulan-Ude, the capital of the republic, although many live more traditionally in the countryside. They speak a central Mongolic language called Buryat. According to UNESCO's 2010 edition of the Atlas of the World's Languages in Danger, the Buryat language is classified as severely endangered. Several attempts at a Franco-Mongol alliance against the Islamic caliphates, their common enemy, were made by various leaders among the Frankish Crusaders and the Mongol Empire in the 13th century. Such an alliance might have seemed an obvious choice: the Mongols were already sympathetic to Christianity, given the presence of many influential Nestorian Christians in the Mongol court. The Franks (Western Europeans and those in the Crusader States of the Levant) were open to the idea of support from the East, in part owing to the long-running legend of the mythical Prester John, an Eastern king in a magical kingdom who many believed would one day come to the assistance of the Crusaders in the Holy Land. The Franks and Mongols also shared a common enemy in the Muslims. However, despite many messages, gifts, and emissaries over the course of several decades, the often-proposed alliance never came to fruition.Contact between Europeans and Mongols began around 1220, with occasional messages from the papacy and European monarchs to Mongol leaders such as the Great Khan, and subsequently to the Ilkhans in Mongol-conquered Persia. Communications tended to follow a recurring pattern: the Europeans asked the Mongols to convert to Western Christianity, while the Mongols responded with demands for submission and tribute. The Mongols had already conquered many Christian and Muslim nations in their advance across Asia, and after destroying the Muslim Abbasid and Ayyubid dynasties, for the next few generations fought the remaining Islamic power in the region, the Egyptian Mamluks. Hethum I, king of the Christian nation of Cilician Armenia, had submitted to the Mongols in 1247, and strongly encouraged other monarchs to engage in a Christian-Mongol alliance, but was only able to persuade his son-in-law, Prince Bohemond VI of the Crusader State of Antioch, who submitted in 1260. Other Christian leaders such as the Crusaders of Acre were more mistrustful of the Mongols, perceiving them as the most significant threat in the region. The Barons of Acre therefore engaged in an unusual passive alliance with the Muslim Mamluks, allowing Egyptian forces to advance unopposed through Crusader territory to engage and defeat the Mongols at the pivotal Battle of Ain Jalut in 1260.European attitudes began to change in the mid-1260s, from perceiving the Mongols as enemies to be feared, to potential allies against the Muslims. The Mongols sought to capitalize on this, promising a re-conquered Jerusalem to the Europeans in return for cooperation. Attempts to cement an alliance continued through negotiations with many leaders of the Mongol Ilkhanate in Persia, from its founder Hulagu through his descendants Abaqa, Arghun, Ghazan, and Öljaitü, but without success. The Mongols invaded Syria several times between 1281 and 1312, sometimes in attempts at joint operations with the Franks, but the considerable logistical difficulties involved meant that forces would arrive months apart, never able to coordinate activities in any effective way. The Mongol Empire eventually dissolved into civil war, and the Egyptian Mamluks successfully recaptured all of Palestine and Syria from the Crusaders. After the Fall of Acre in 1291, the remaining Crusaders retreated to the island of Cyprus. They made a final attempt to establish a bridgehead at the small island of Ruad off the coast of Tortosa, again in an attempt to coordinate military action with the Mongols, but the plan failed, and the Muslims responded by besieging the island. With the Fall of Ruad in 1302 or 1303, the Crusaders lost their last foothold in the Holy Land.Modern historians debate whether an alliance between the Franks and Mongols would have been successful in shifting the balance of power in the region, and if it would have been a wise choice on the part of the Europeans. Traditionally, the Mongols tended to see outside parties as either subjects or enemies, with little room in the middle for a concept such as an ally. founded a state known as the Liao dynasty (907-1125) in Central Asia and ruled Mongolia and portions of the present-day Russian Far East, northern Korea, and North China. In 1206 Genghis Khan was able to unite and conquer the Mongols, forging them into a fighting force which went on to establish the largest contiguous empire in world history, the Mongol Empire (1206-1368). Buddhism in Mongolia began with the Yuan emperors' conversion to Tibetan Buddhism. Hulagu Khan, also known as Hülegü or Hulegu (Mongolian: Хүлэгү/ᠬᠦᠯᠡᠭᠦ, translit. Hu’legu’/Qülegü; Chagatay: ہلاکو; Persian: هولاکو خان‎, Hulâgu xân; Arabic: هولاكو خان/ هَلَاوُن; Chinese: 旭烈兀; pinyin: Xùlièwù [ɕû.ljê.û]; c. 1218 – 8 February 1265), was a Mongol ruler who conquered much of Western Asia. Son of Tolui and the Keraite princess Sorghaghtani Beki, he was a grandson of Genghis Khan and brother of Ariq Böke, Möngke Khan, and Kublai Khan. The Khalkha (Mongolian: Халх, Halh Mongolian pronunciation: [xɑɮx]) is the largest subgroup of Mongol people in Mongolia since the 15th century. The Khalkha, together with Chahars, Ordos and Tumed, were directly ruled by Borjigin khans until the 20th century; unlike the Oirats, who were ruled by Dzungar nobles, or the Khorchins, who were ruled by Qasar's descendants. The two original major Khalkha groups were ruled by the direct male line descendants of Dayan Khan. The Baarin, Khongirad, Jaruud, Baigut, and the O'zeed (Ujeed) became Dayan Khan's fifth son Achibolod's subjects, thus formed the Southern Five Halhs. The Qaraei, Jalairs, Olkhonud, Khatagin, Besut, Iljigin, Gorlos, Uriankhai, Sartuul, Tanghut, Khotogoid, Khuree, and Tsookhor became Dayan Khan's youngest (could be third) son Geresenje's (Mongolian: Гэрсэне Жалайр Хан) subjects, thus formed the "Аглагийн арван гурван хүрээ Халх" or Thirteen Khalkhas of the Far North.There were also numerous direct descendants of Genghis Khan who had formed the ruling class of the Khalkha Mongols prior to the 20th century, but they were and still also regarded as Khalkha Mongols rather than belonging to a special unit. The Thirteen Khalkhas of the Far North are the major subethnic group of the independent state of Mongolia. They number 1,610,400 (78.8%) of Mongolia's population (1989 figures). 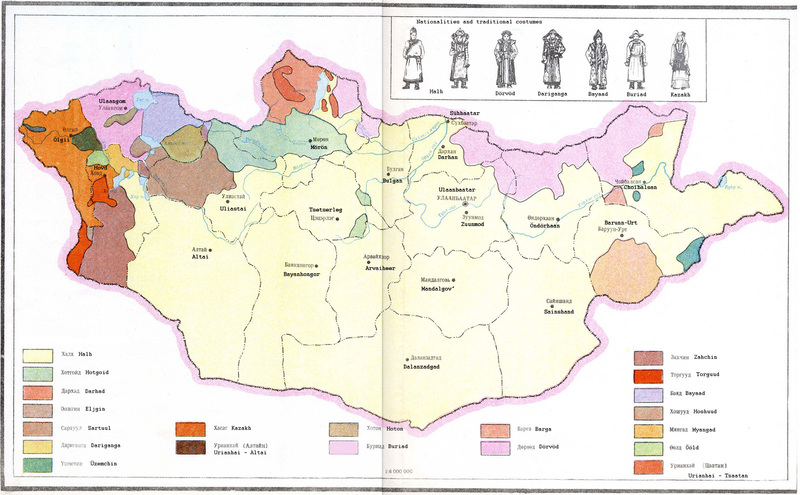 The Khalkha or Halh dialect is the standard written language of Mongolia. Kublai (; Mongolian: Хубилай, Hubilai; Chinese: 忽必烈) was the fifth Khagan (Great Khan) of the Mongol Empire (Ikh Mongol Uls), reigning from 1260 to 1294 (although due to the division of the empire this was a nominal position). He also founded the Yuan dynasty in China as a conquest dynasty in 1271, and ruled as the first Yuan emperor until his death in 1294. Kublai was the fourth son of Tolui (his second son with Sorghaghtani Beki) and a grandson of Genghis Khan. He succeeded his older brother Möngke as Khagan in 1260, but had to defeat his younger brother Ariq Böke in the Toluid Civil War lasting until 1264. This episode marked the beginning of disunity in the empire. Kublai's real power was limited to China and Mongolia, though as Khagan he still had influence in the Ilkhanate and, to a significantly lesser degree, in the Golden Horde. If one counts the Mongol Empire at that time as a whole, his realm reached from the Pacific Ocean to the Black Sea, from Siberia to what is now Afghanistan.In 1271, Kublai established the Yuan dynasty, which ruled over present-day Mongolia, China, Korea, and some adjacent areas, and assumed the role of Emperor of China. By 1279, the Mongol conquest of the Song dynasty was completed and Kublai became the first non-Han emperor to conquer all of China. The Mongol invasion of Europe in the 13th century was the conquest of Europe by the Mongol Empire, by way of the destruction of East Slavic principalities, such as Kiev and Vladimir. The Mongol invasions also occurred in Central Europe, which led to warfare among fragmented Poland, such as the Battle of Legnica (9 April 1241) and in the Battle of Mohi (11 April 1241) in the Kingdom of Hungary.The operations were planned by General Subutai (1175–1248) and commanded by Batu Khan (c. 1207–1255) and Kadan (d. c. 1261). Both men were grandsons of Genghis Khan; their conquests integrated much European territory to the empire of the Golden Horde. Warring European princes realized they had to cooperate in the face of a Mongol invasion, so local wars and conflicts were suspended in parts of central Europe, only to be resumed after the Mongols had withdrawn. Chinese Mongols are citizens of the China who are ethnic Mongols (Chinese: 蒙古族; pinyin: Měnggǔzú; literally: 'Mongol ethnicity'). They form one of the 55 ethnic minorities officially recognized by the People's Republic of China. There are approximately 5.8 million people classified as ethnic Mongols living in China. Most of them live in Inner Mongolia, Northeast China, Xinjiang, etc. The Mongol population in China is over twice that of the sovereign state of Mongolia. The Secret History of the Mongols (Traditional Mongolian: Mongγol-un niγuča tobčiyan, Khalkha Mongolian: Монголын нууц товчоо, Mongolyn nuuts tovchoo) is the oldest surviving literary work in the Mongolian language. It was written for the Mongol royal family some time after the 1227 death of Genghis Khan (also known as Temujin). The author is anonymous and probably originally wrote in the Mongolian script, but the surviving texts all derive from transcriptions or translations into Chinese characters that date from the end of the 14th century and were compiled by the Ming dynasty under the title The Secret History of the Yuan Dynasty (Chinese: 元朝秘史; pinyin: Yuáncháo Mìshǐ). Also known as Tobchiyan (Chinese: 脫必赤顏; pinyin: Tuōbìchìyán or 脫卜赤顏; Tuōbǔchìyán) in the History of Yuan. The Secret History is regarded as the single most significant native Mongolian account of Genghis Khan. Linguistically, it provides the richest source of pre-classical Mongolian and Middle Mongolian. The Secret History is regarded as a piece of classic literature in both Mongolia and the rest of the world.